(1/10) Happy Martin Luther King Day. U.S. markets are closed, as is the Federal Government. 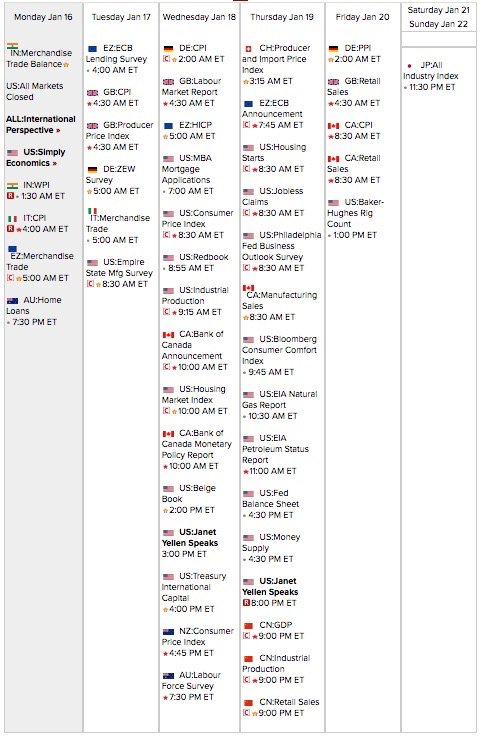 This week’s international economic events, via Econoday. State public pension plans are now underfunded by nearly $5.6 trillion – an increase of almost $900 billion from State Budget Solutions’ (SBS) last comprehensive report in 2014. When state pension funds are examined through the lens of a more realistic valuation, pension funding gaps are revealed to be much larger than reported in official state financial documents. This report totals state-administered plans’ assets and liabilities and finds nationwide total unfunded liabilities to be $5.59 trillion. The nationwide funding level is a mere 35 percent, which is one percentage point lower than two years ago. Combined across all states, the price tag for unfunded pension liabilities is now $17,427 for every man, woman and child in the United States. (4/10) On public pensions, three (3) links to my work on the topic. First, at Mic, why public pensions should matter a lot to millennials. Second, a transcript of my testimony on pension reform to the Michigan Legislature. Last, my interview on the topic for the Cato Institute (embedded below). here’s the map (*left panel of the graphic below*). But then it hit me: Jeff Sessions as U.S. Attorney General. Ahead of the curve: The future of performance management. What happens after companies jettison traditional year-end evaluations? Most corporate performance-management systems don’t work today, because they are rooted in models for a different era of work. See how G.E., Microsoft, Netflix and others are changing. What might happen in China in 2016? Millions of people being relocated from cities, fewer jobs, greater centralization, and more movie blockbusters were just some of Gordon Orr’s predictions for the year. How accurate were they? The economic essentials of digital strategy. A supply-and-demand guide to digital disruption that gets beyond the specter of new digital competitors to analyze the cause and nature of transformation. Disruptive trends that will transform the auto industry. Technology-driven trends will revolutionize how industry players respond to changing consumer behavior, develop partnerships, and drive transformational change. Where machines could replace humans—and where they can’t (yet). The technical potential for automation differs dramatically across sectors and activities. The CEO guide to customer experience. Companies that create exceptional customer experiences can set themselves apart from their competitors. Want to be a better leader? Observe more and react less. Overloaded executives need coping mechanisms. This personal reflection shows how meditation can help with three common challenges faced by leaders: email addiction, coping with disappointment, and social isolation. Poorer than their parents: A new perspective on income inequality. The real incomes of about two-thirds of households in 25 advanced economies were flat or fell between 2005 and 2014. Without action, this phenomenon could have corrosive economic and social consequences. An incumbent’s guide to digital disruption. Incumbents needn’t be victims of disruption if they recognize the crucial thresholds in their life cycle, and act in time. People analytics reveals three things HR may be getting wrong. More sophisticated analyses of big data are helping companies identify, recruit, and reward the best personnel. The results can run counter to common wisdom. (7/10) Artificial Intelligence links: Great podcast for those new to reading and thinking about AI from Goldman Sachs. Outstanding long-form piece from the NYTimes on AI and Google. Also great for those new to AI, a decent article looking at some of the current applications of AI already deployed. Also on AI—now for those keeping current and a tad more advance—two recent developments on the AI ethics front: First, new foundation funded by some high profile names and very big money, titled “Ethics and Governance of Artificial Intelligence Fund.” Second, policy and legal developments out of the EU Parliament, which may seem quaint and/or kooky to some now, but will almost certainly define politics in the world’s not so distant future. (8/10) American’s engage in comparative institutional analysis: Big Labor VS Big Business VS Big Government. Gallup survey results below tracking the question back to 1965. (9/10) Bloomberg’s “Odd Lots” podcast had a great episode on some of the math underlying much modern, professional financial analysis. Given many conversations on finance I’ve had with many friends, and the general interest that tends to surround financial markets, I thought I’d recommend this episode and a few other items. For those who have formerly studied financial markets through the financial economics lens, I assume you’ve caught all of this (though if not, I recommend filling knowledge gaps as they appear). One great intro level resource: the Kahn Academy lectures on finance. I find them engaging and accessible to non-economists/non-mathematicians, while also quite deep and rigorous (getting through all of this is roughly the first 1/4 to 1/3 of a finance bachelors). Also, shout-out to Kahn Academy for getting me through Calculus 3 and Linear Algebra. Next and probably even more essential than the basics, you MUST understand “A Random Walk Down Wall Street.” Great NPR interview here. Last, a few videos from titans of modern social sciences, best-selling authors, consummate media & TED Talk/Aspen Ideas fixtures, and gurus of understanding financial markets. Embedded below: Robert Shiller, Ray Dalio, Cliff Asness, Daniel Kahneman, and Nassim Nicholas Taleb. Additionally, the video from Robert Schiller is from his Yale Financial Markets course, which you can “take” via Open Yale and provides a great second tier of education after grasping the Kahn Academy content. (10/10) 2017 Predictions via Podcast. Two on the economy, here and here. Two on politics and public policy, here and here. I encourage you to share your own predictions in the comments or on Twitter (@WilliamFreeland).